These Black 3D 5" Uppercase Designer Letters bring a bold look to bulletin boards. The 3D-style black and gray punch-out letters are designed to be highly visible from a distance. The 3D style makes them perfect for use on displays related to STEM (science, technology, engineering, or math) and industrial arts or in a makerspace center. This package comes with 110 pieces, including uppercase letters, punctuation marks, and social media symbols # and @. 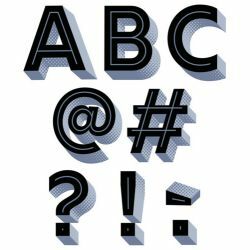 The simple, modern look of these approximately 5" punch-out letters makes them versatile for use on any bulletin board or display in a school, an office, a college dorm, a senior living residence, a church, or a daycare center. 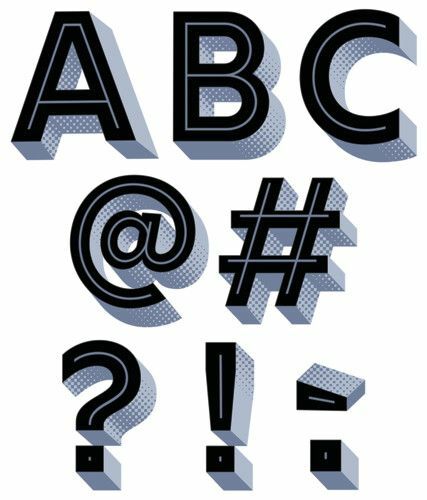 110 Uppercase letters, punctuation marks and social media symbols @ and #.